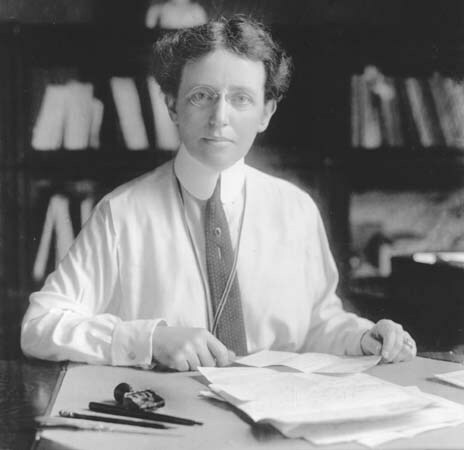 A pioneering figure in the history of public health, Sara Josephine Baker revolutionized the field of child healthcare in the early twentieth century. Baker developed measures that dramatically reduced infant mortality in New York City and laid the foundation for modern preventive public health strategies. While Baker did not leave records of her sexual orientation or identity, she maintained a close personal relationship with the novelist Ida Wylie, with whom she lived for many years. Born and raised in Poughkeepsie, NY in a well-to-do white family, Baker’s mother Jenny Brown was one of the first women to enroll in Vassar College, and her father Orlando Daniel Mosher Baker was an eminent local lawyer. Baker remembered her childhood fondly, describing herself as a “tomboy type” who loved adventure stories, fishing, and baseball. Yet Baker was also “thoroughly trained in the business of being a woman,” planning to attend Vassar, then marry and raise a family. At age sixteen, however, the sudden death of both her brother and her father left the family in financial trouble. Baker had to find a way to support herself, her mother and her sister. Baker decided to enroll in the Women’s Medical College of the New York Infirmary, an unorthodox decision at a time when a woman doctor was likely to be considered an “intellectual and moral hermaphrodite.” Founded by the pioneering female physician Elizabeth Blackwell, the Women’s Medical College was one of two institutions open to women at the time (Philadelphia’s Female Medical College, founded in 1850, was the other.) Baker considered it a great honor to train under Blackwell’s sister Emily, a woman with a “striking and dominant personality” who shared her sister’s spirit and vision. S. Josephine Baker, Fighting for Life (New York Review of Books, 2013), 9. Dr. Paul de Lacy Baker quoted in Regina Markell Morantz-Sanchez, Sympathy & Science: Women Physicians in American Medicine (UNC Press Books, 2000), 51. Baker, Fighting for Life, 35.